iSkysoft PDF Editor bestows you full control over your PDF files. You can conduct everything from simple tasks like inserting, deleting, rotating, cropping, splitting, extracting to adding watermarks, background changing and freely using them inside of your document. Employing the fabulous interface of iSkysoft PDF Editor you can insert important comments, highlight major lines, and draw shapes and lines which make your page more descriptive. – The “Comment” feature allows you to make a place into which you can insert your text comments and sticky note. – There is also a descent set of markup drawing tools prepared for the users including squares, circles, etc. – You can highlight the text using the “Text Highlight” and “Area Highlight” button. 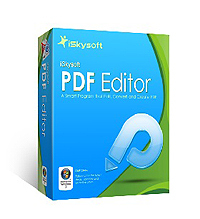 iSkysoft PDF Editor takes the security of your PDF documents extremely seriously. The “Protect” tab in the interface speaks of itself pretty clearly. You can protect your document with a full password or simply protect some functions inside of your documents. Moreover, you get to digitally sign your document and set multiple passwords for your document. This application offers consolidated encryption to guarantee the maximum protection of your documents. Your PDFs remain just safe with iSkysoft PDF Editor. Sharing PDF is vital and iSkysoft PDF Editor knows that. Your sharing armory includes Dropbox, Google Drive, Evernote and direct Email. You can send your documents through any of the above options incredibly fast and with maximum protection. All you have to do is to enter your accounts’ specifications of any of the named services. In addition, from the application you can also easily print your PDF with customized options. 3. Search specific text for redaction.